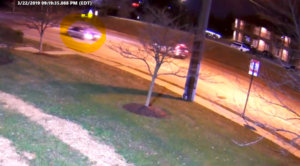 Police have released video of the suspect vehicle which can be seen fleeing the scene from left to right across the screen after the collision. The vehicle is believed to be an early 90’s model Honda Accord that may have a black stripe or trim across the doors. The vehicle will likely have damage to the front passenger side corner of the vehicle. Every tip, regardless of how small, will be investigated. Tips received through Metro Crime Stoppers may also be eligible for a reward of up to $2,000. Submit a tip 1-866-7-LOCKUP.